Yesterday I had a $25 credit for Instacart so I decided to hurry up and spend it right away. I have no control over myself when it comes to having money for food. I spend, spend, spend. I live for the thrill of trying new foods out. My game plan yesterday was to use my credit to stock up on not only healthy foods BUT adventurous foods as well. I ended up getting a kiwano horned melon! What?? Keep reading to learn more! In the photo above you can see the small haul that I acquired from Meijer. I usually avoid the Meijer near our house because of the long checkout lanes as opposed to the speedy service at Kroger that is right across the street. However, Meijer does carry quite a bit of food that is not available at Kroger. Since I had the credit to get food delivered to my home and avoid the checkout lines altogether, I placed my order with Meijer. I ended up with 6 bottles of Kevita Kombucha. They had a promo where you could get free delivery if you purchased $20+ of this line of beverages. I love kombucha anyway and it is a nice treat for me to have some in my fridge so I figured I would load up on that to waive the $10 delivery fee. I also stocked up on exotic fruits. Dragonfruit is a very rare treat for me because of the high cost. My daughter has been begging me to get one so I did. I also got a passionfruit,Â starfruit, papaya, kiwi, and last but not least~ a kiwano horned melon (see photo below). So what on Earth does this look like inside? Check out the photo below. The inside of a kiwano horned melon is certainly unusual. Was not really expecting the insides to look like green slime but that is what it resembles most~ slime! There are also a ton of seeds inside, which are edible. My 8-year-old daughter, Chloe, and I got brave and decided to give it a whirl. I scooped out the guts with a spoon and put it inside of a bowl. We ate it like a soup. It had a very faint taste of citrus. We were expecting much more flavor than it delivered so it was a bit of a letdown. The kiwano horned melon has quite a few health benefits that may make it worth eating. It is packed with antioxidants. It can also help improve cognitive function, heart health, weight loss (boosts metabolism), improve vision (lots of vitamin A), and it can also aid in digestion (contains a great amount of dietary fibers). Would I ever purchase this fruit again? The answer to that is no. This melon is quite pricey coming in at about $5 a melon (at Meijer). The price was worth it, to me, for the experience of trying it but the flavor was so bland and the slimy texture with all of those seeds in there was not very palatable. Also, I am not sure how this food would be used in any type of recipe. It is not versatile at all. So if you enjoy eating a bowl of bland slime the kiwano horned melon just might make your day. On the other hand, I asked my daughter if she would want me to purchase this again and she told me that she would love to have it again. She describes the taste of the kiwano horned melon as, “sweets slime”. A future foodie in the making? Considering that she is only 8 years old, I think she is definitely an adventurous eater. 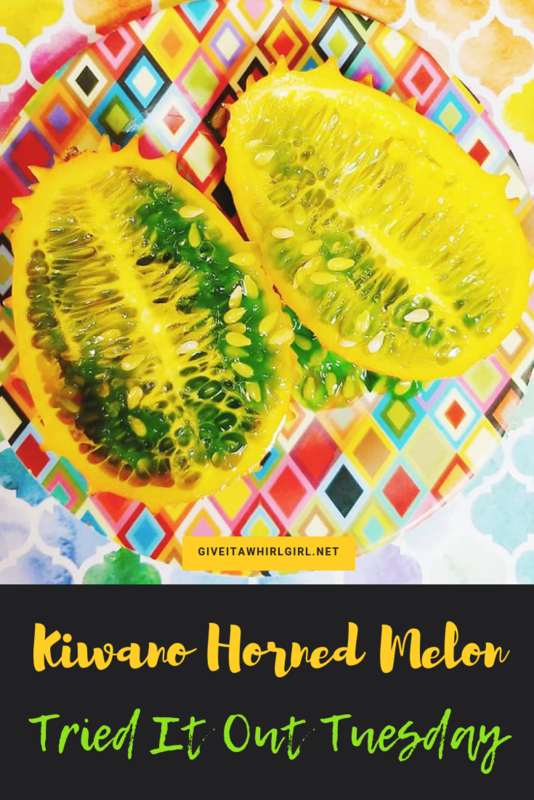 Have you ever tried the kiwano horned melon? What are your thoughts? Leave me a comment below. This entry was posted in Tried It Out Tuesday and tagged clean eating, foodie, fruit, groceries, grocery haul, grocery shopping, haul, health benefits, healthy, healthy food, healthy haul, healthy snack, kevita, kiawano horned melon, kombucha, melon. Bookmark the permalink. No, I am not going to enjoy something that would be considered slimy in texture. I like trying out new things but I’ll pass on this fruit. Interesting! Never seen that before! My daughter loves it but I was totally on the fence about it. It was fun to eat but so bland!